Once your child has passed the age of 5, buying a Nerf gun for them can be tricky. On one hand, you don’t want to buy them a blaster that is too heavy or too difficult to work, but on the other hand, you don’t want to buy them a blaster that doesn’t excite them. 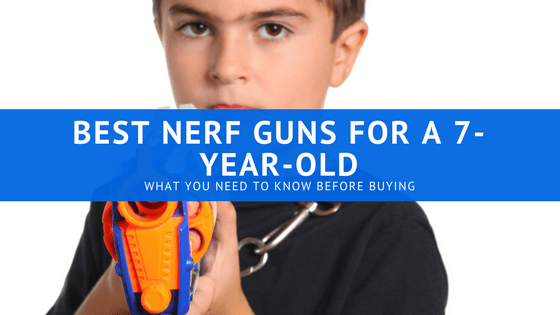 Instead of wasting time worrying about whether or not the gun you purchase will be suitable, take a look at the buyer’s guide and some of the best Nerf guns for a 7-year-old below. Before you purchase any Nerf gun for a 7-year-old, here are some things that you should take into consideration. When it comes to giving a child a Nerf gun, the biggest concern is safety. A Nerf gun that is too powerful has the potential to hurt you child and those he or she plays with. However, a Nerf gun that is too weak may not be any fun to play with if your child is a little stronger than most their age. Use common sense when you’re purchasing any type of gun for your 7-year-old. If they typically don’t cry when things hit them and they would be able to handle a fast Nerf dart, then it should be fine to purchase a more powerful Nerf gun for your child. If you suspect that your child won’t be able to handle a gun that shoots farther and faster, get a gun that’s not as powerful. There are several reasons why you should be selective about what type of ammunition is used in the gun that you are purchasing your child. Although it’s not typical for your child to put things in their mouth at this age, you should still consider whether or not it is appropriate for them to have smaller ammo in their guns if they do have a tendency to place small objects in their mouth. The type of ammunition that your child is going to be using is also important because it may have a harder impact than other ammunition. For example, Nerf produces a high-impact, foam ball round for some of its guns. Obviously, this type of ammunition is not suitable for a young child. Aim to purchase the normal foam darts and the discs that Nerf provides to keep your child safe. Nerf knows no bounds when it comes to size. Some Nerf guns are so large that even adults have trouble carrying them into battle. While the larger-sized guns are fun to play with, your child won’t be too happy when they aren’t able to carry them around. Try to get a blaster that you can imagine your 7-year-old running around with. The best ones for the younger children tend to be the mini single-bullet blasters or the smaller semi-automatic handguns. If your child is looking to own a bigger gun, make sure it comes with additional shoulder straps and stands so your child can use it comfortably. The problem with buying gifts for 7-year-olds is that they typically get bored of their new toys very quickly. One minute, they are excited to play with their toy and the next minute they are using a stick that they’ve found on a ground to play pretend. Therefore, you shouldn’t spend too much money on a Nerf gun if they will only be using it for a very brief amount of time. You should also take into consideration how well they treat their toys. You don’t want to give an expensive blaster to a child who usually throws their toys around or leaves them on the floor. However, it is okay to invest money into a toy that a child will be taking care of, especially if said child is a Nerf fan who has frequent Nerf battles. While some blasters may seem to be okay for to children to use, there may be certain qualities of those blasters that can still make them unsuitable for children. For example, some Nerf guns have cocking mechanisms that are difficult to pull even on the smaller blasters. Other Nerf guns are built in such a way that it is awkward to hold and therefore difficult to use in a battle. Try to stay away from blasters with these qualities. Even if a blaster has redeeming qualities that far outweigh the problematic parts, children will not look past these things and will only focus on the fact that they are not able to use them properly. 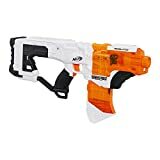 If you are looking for a simple blaster that is small and gentle, then you should purchase the Nerf N-Strike Jolt Blaster. 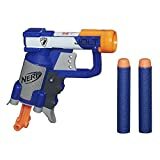 The Nerf N-Strike Jolt Blaster is a mini-blaster that shoots one dart at a time, has a simple cocking mechanism at the bottom that pulls down to prepare a dart for launch, and comes with two darts. This model can be found online for around $8. This blaster seems to have no problems with how it functions and is a great gun for a 7-year-old who is just starting to get into Nerf. 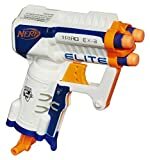 If you’re looking for a blaster that has similar qualities to the Nerf N-Strike Jolt Blaster but has a little more firepower, the Nerf N-Strike Elite Triad EX-3 Blaster is what you should consider purchasing. The Nerf N-Strike Elite Triad EX-3 Blaster has the same cocking mechanism as the previous blaster, can hold up to three darts in its barrel, is able to shoot one after the other, and has a body that is known for its durability, which is great if you are purchasing this blaster for a 7-year-old known to get rowdy with his toys. You can find this toy online for around $10. Much like the last blaster, this one appears to have no problems with the way that it functions. If quality and safety is a concern for you, this is definitely one of the blasters that you should be purchasing for your child. For those of you who have a 7-year-old who is more serious about Nerf battles, the Nerf Zombie Strike Hammershot Blaster will give them the firepower that they need to attack their opponents. This blaster includes a rotating barrel that can hold up to five bullets, it uses a hammer cocking mechanism that allows the user to prepare and shoot the gun with one hand, and is also known for its durable body. Along with these qualities, this blaster features a special design and custom darts since it is part of the zombie strike line, which is great if your child wants a blaster that is stylish. You can find the Nerf Zombie Strike Hammershot Blaster for around $14. This blaster also appears to have no problems with its functionality. Overall, this is a good blaster for a child who is into Nerf and who intends to use it frequently. 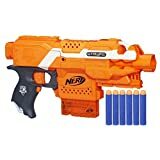 The Nerf N-Strike Elite Stryfe Blaster is the type of blaster that you’ll want to consider purchasing for your child if they aren’t able to handle an assault rifle but still want the same kind of features in a smaller blaster. This blaster is capable of semi-automatic blasting, comes with an ammo clip that can hold up to six darts, and is able to launch darts up to a distance of 90 feet. Although the ammo capacity isn’t much more impressive than that of the hammershot blaster, the best part about this gun is that it can be modified. If your child needs to be able to hold more ammo, you can always purchase extra ammo clips with higher limits. With more features, however, come more problems. One of the issues with this gun is its price. Unlike the previous blasters, this one is usually priced around $40 and will cost more down the road because it requires four AA batteries. Also, this gun has been known to jam because the ammo clip fits a little loose. Still, if you are looking for the best Nerf gun that is semi-automatic and is easier for a smaller child to handle, this gun is the one. The Nerf Doomlands Impact Zone Desolator is probably one of the few assault rifles that a 7-year-old would be able to handle and would enjoy playing with. This blaster features an ammo clip that is capable of holding up to 10 darts, has a cool arctic design on its body and comes with its own custom bullets that match the outer look, and has a transparent casing that shows how the blaster fires. This model can be found online for around $30. This is one of the few semi-automatic Nerf blasters that appear to have no problems with its functionality. However, it does take four AA batteries and should only be purchased if your child will be taking care of it and getting good use out of it. If this is the case, and they can handle an assault rifle, the Nerf Doomlands Impact Zone Desolator is the way to go. Overall, we recommend that you purchase the Nerf Zombie Strike Hammershot Blaster. Although it may not have the same capabilities as the semi-automatic weapons mentioned in this list, it is more reliable and it is less of an investment that you have to make in the event that your child breaks the gun or loses interest. If you’ve seen any guns on this list that you would like to purchase, you can do so by clicking on the links below.